Don't let the gimmicky name fool you. The "12 Commitments to the American People" that former New York City mayor Rudy Giuliani unveiled in a June 12 speech in Bedford, N.H., are more than political slogans. The pledges serve two purposes. The first is policy-oriented. So far this year, no other GOP candidate for president has laid out as comprehensive an agenda as Giuliani's. Which is saying something, because the 12 commitments are pretty sketchy in places. For example, the word "Iraq" does not appear in any of them. The second purpose the 12 commitments serve is political. 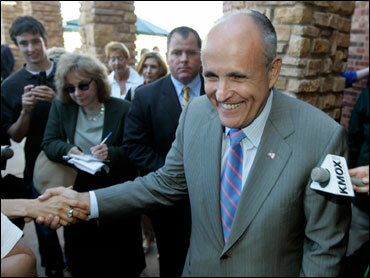 By making specific pledges to voters months before any voting occurs, Giuliani is attempting to shape the debate. By outlining goals and pledging concrete results, Giuliani is able to highlight his successes in reforming New York City during his two terms as mayor. The Giuliani campaign wants to reinforce the idea that the mayor is ready to be president right now, not just on January 20, 2009. Another aim is to draw sharp contrasts between Giuliani's record and agenda and those of his opponents, both Republicans and Democrats. "The two people in Rudy's sights now are Fred Thompson and Hillary Clinton," says Fred Siegel, author of "The Prince of the City," a history of Giuliani's mayoralty. So, what are the 12 commitments? Giuliani says he'll keep America "on offense" in the war on terror, end illegal immigration, cut spending, cut taxes, make government accountable, push America toward energy independence, introduce free-market health care reforms, increase adoptions and decrease abortions, reform tort law and appoint strict constructionist judges, prepare "every community in America" for a terrorist attack or natural disaster, introduce a school-choice plan, and promote free trade and globalization. It's an outsized agenda for an outsized political personality. The list of commitments is flexible, with one exception. To Giuliani, nothing is more important than his pledge to keep America "on offense" against her enemies. Other commitments will rise or fall in importance at different times in the campaign. For instance, last week Giuliani said the sixth commitment, energy independence, eventually may rise to number two, since the issue relates to national security. And some new commitments may show up as well. "Could be, over a period of time, we'll add several commitments as we talk to people and listen to them more," Giuliani said in Bedford. The 12 commitments have been in the works for some time, says an unpaid Giuliani adviser, but the campaign "moved ahead fairly quickly." One reason the mayor may have decided to unveil his pledges so early in the campaign is the looming presence of former senator Fred Thompson, who plans to announce his presidential candidacy sometime this summer. In an NBC News/Wall Street Journal poll released last week, Thompson placed second among GOP voters nationwide. Giuliani is first. A senior Giuliani aide disputes that the rollout was in any way rushed. "That's just not accurate," says the aide. That Giuliani would outline the 12 commitments last week had been planned for a while, according to the senior aide. Even the choice of the word "commitment" was the subject of consideration. It's intended to convey Giuliani's dedication and willingness to be held accountable. "This was an attempt to be goal-oriented," the senior aide says of the 12 commitments. Giuliani, the aide continues, is "someone who likes measurement." An example of this is Giuliani's pledge to increase the number of adoptions and reduce the number of abortions. It's a practical goal that skirts the normative, values-based questions typically associated with the abortion issue. Giuliani has been meeting with policy wonks since last Christmas. He's deeply interested in policy and takes the lead role in staff briefings with outside experts. One of Giuliani's major fundraisers, private equity magnate T. Boone Pickens, speaks frequently with the former mayor about energy. Another large influence is Thomas P. Barnett, the strategist whose book "The Pentagon's New Map" was a major bestseller. Giuliani read it, loved it, and met with Barnett. One of Barnett's themes is expanding the sphere of American economic interaction with the rest of the world. Giuliani alludes to this idea in his 12th commitment, and it will likely play a large part in the mayor's forthcoming Foreign Affairs essay, slated for publication this fall. Two myths have sprung up about the 12 commitments. The first is that the list is incomplete or evasive because Iraq goes unmentioned. But Giuliani has said he considers the war in Iraq a part of the overall war on terror, so remaining there in some capacity is implied in his prescription to stay "on offense." The second myth is that Giuliani's list lacks substance. "His so-called 'commitments' are nothing more than empty rhetoric," Democratic National Committee communications director Karen Finney said last week. If that's the case, why did Finney feel the need to release a four-page e-mail attacking them? Fact is, while the one-sentence commitments are light on detail, Giuliani added specifics to each in his Bedford address and in subsequent interviews. "Offense" against terror means enforcing the Patriot Act, continuing NSA surveillance of terrorist phone calls into the United States, maintaining the current policy on interrogations, and creating ten new combat brigades for the military, as well as the creation of a "stabilization and reconstruction corps," made up of military and civilian personnel, that would specialize in nation-building. "We may very well need more," Giuliani said in Bedford, "but that's an appropriate way to start." Ending illegal immigration means an ID card for every noncitizen in the United States, a database tracking them, a one-strike policy for noncitizens convicted of crimes, physical and virtual border fencing, and a BorderStat program to study progress in enforcement. There's also an Americanization component, requiring new citizens to speak, read and write English. Energy independence means building new nuclear plants, subsidizing ethanol and biodiesel, and allowing new oil exploration in American coastal areas. Introducing free-market health care reforms means a $15,000 tax deduction for private insurance, health savings accounts, and medical malpractice reform. The list goes on, but there's an underlying message. "Government is about real issues," Giuliani said, "and if you don't have an agenda, you can't march into the future. The future takes control of you." As for the immediate future, Giuliani plans to spend the summer rolling out his 12 commitments. Each will be the subject of an individual speech. And these speeches will keep the mayor in the news as the primary campaign hits the summer doldrums. Who knows? They might even steal some attention from Fred Thompson.